Emperor Maximilian I died on 12th January 1519. He has a good claim to be awarded the title of founding father of the Austro-Hungarian Empire, although he did so not by force of arms but by contracting successful dynastic marriages for his children and grandchildren, having been the beneficiary of one himself. Maximilian was born in 1459, the son of Frederick III, a member of the Habsburg family and the Holy Roman Emperor. Although the title sounds grand enough it did not mean a great deal in practice, the “empire” being a loose association of mid-European states, their only strong feature of commonality being their opposition to the growth of Protestantism in northern Europe. Frederick chief opponent was Charles the Bold, the Duke of Burgundy. 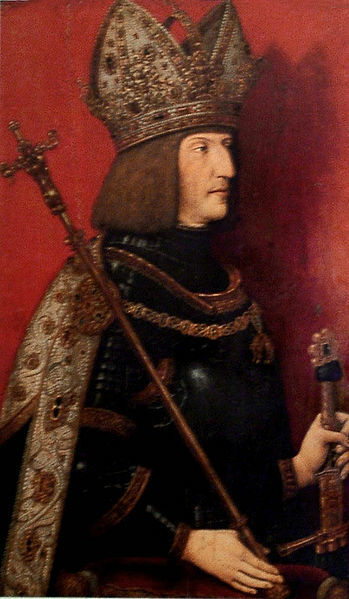 In order to turn Charles into an ally, he engineered a marriage between Maximilian and Charles’s daughter Mary, which took place in 1477 after Charles had died in battle. Mary was heiress to the vast territories of Burgundy in eastern France and also the lands occupied by much of modern Belgium and the Netherlands. She died in 1482 after a riding accident, leaving two young children, one of whom, Philip, was now the titular Duke of Burgundy. Once Philip was old enough, he was married to Joanna of Castile, the heiress of most of the Iberian peninsula. However, he died at the age of 28 in 1506, having become King of Castile for a short time before so doing. Philip left two sons, Charles and Ferdinand. Their grandfather Maximilian got busy in the marriage market on their behalf, with the result that Ferdinand married Princess Anne of Hungary. Her brother should have inherited the thrones of Bohemia and Hungary but he was killed in battle in 1526, leaving Ferdinand to claim them. Meanwhile, Charles was heir to all the Habsburg territories in Austria, Burgundy and Spain. After Maximilian’s death he married his cousin Isabella of Portugal while his sister married King John III, Isabella’s brother. Between them, the Habsburgs therefore managed to rule much of Europe, the general aim being to keep the French in their place. At the height of his power, Charles’s empire encompassed most of modern Austria, Germany, Belgium, the Netherlands, Spain, parts of Italy, and vast swathes of the New World. At the root of it all was grandfather Maximilian, who created an empire by marriage. The Habsburg empire only finally disintegrated at the end of World War I in 1918.